If you’re a golfer and you’ve been wondering why your game has been subpar, there’s a good chance it’s because of your glasses. 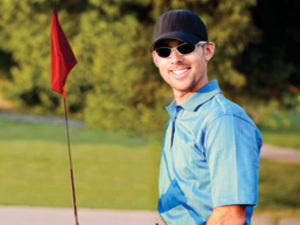 Standard progressive lenses are designed for everyday use and are not optimized for the golf course. Did you realize you focus on three crucial focal points while on the green? Yep, the scorecard in your hand, the ball at your feet, and the green in the distance. Because of the optimization in these three vision zones, Shamir Golf™, ensures a more comfortable golfing experience. And we guarantee you’ll play your best game ever, once you can actually see what you’re doing out there! Don’t forget to thank us once you triumph over your golf buddies next weekend. As a golfer, you actually have four important vision zones, near, mid-range and far, but your Peripheral Vision is also crucial. You need to see out of the side of your lenses to where you want the ball to go while at the same time looking at the ball on the ground to line up your shot. Shamir Golf™ provides you with this all-important clear peripheral vision. And since Shamir Golf™ is designed specifically for wraparound frames, you won’t have to sacrifice your style either. Now you can get back to what’s important out there – drinking beer, er… working on your perfect swing!